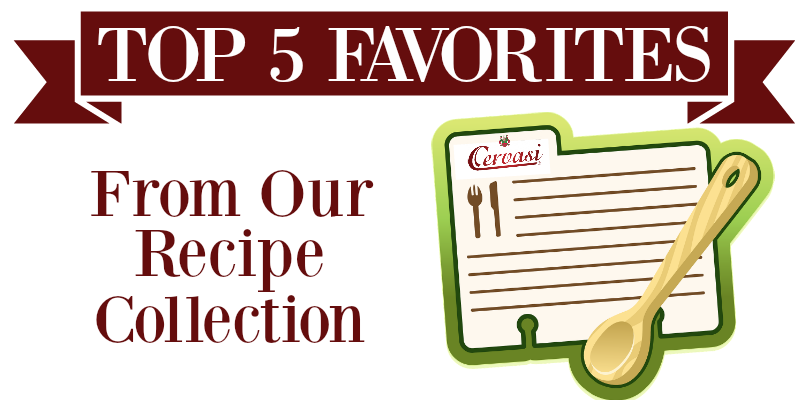 We’ve been sharing recipes on the Cervasi website for a long time. We started to wonder — what are your favorites from our own collection of treasured family recipes? Our Green Bean Artichoke Casserole is great for holidays or any meal. It should be no surprise that our guests are looking for all varieties of pasta recipes because after all… we’re importers of quality Italian pasta (among other specialty ingredients). A handful of the most popular include Pesto Pasta Salad, Traditional Lasagna, Penne ala Vodka and Spaghetti Bolognese. But you might be surprised to learn that the number one searched recipe is the signature side dish present at all our holiday gatherings: Green Bean Artichoke Casserole! We invite you to test and enjoy our recipes— these top faves as well as dozens of others. Curious about some other “secret” family recipes? Let us know what you want to see. Check back often as we continue to add to our recipe collection, blog and Pinterest boards.